A sojourn to the "Mother City" of Cape Town is ideal after a safari adventure. Cape Town is more than a city. 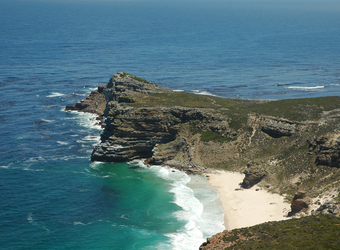 It is where the fabled Cape of Good Hope protrudes out into the confluence of the Atlantic and Indian oceans, their waters the quintessential seasonal breeding habitat for southern right whales and hunting ground for great white sharks. African penguins bathe on the beaches of Simonstown while dolphins and Cape fur seals play just off the shore. The colorful culture and rich history of this small city is icing on the cake. Cape Town has a lot going for it. It has a tremendous amount of natural beauty as well as a burgeoning art scene, award-winning restaurants and a relaxed pace unlike a city. 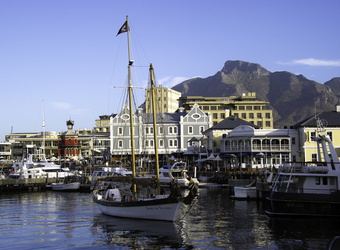 This 4-day extension is the perfect introduction to Cape Town, including a privately guided visit to the Cape of Good Hope and around the Cape Peninsula to see much of the marine wildlife and unique fynbos flora, leaving you with a full day to visit Table Mountain, Robben Island, explore the V&A Waterfront or visit the Cape Winelands. You will be met and privately transferred to your hotel in Cape Town. Located at the Southern tip of the African continent where the Atlantic and Indian oceans meet, Cape Town and the Western Cape are strikingly beautiful. At the foot of Table Mountain, the city of three million is a charismatic blend of cultures, renowned for its scenic setting, creative cuisine and world-class local wines. Outside the city, enjoy spectacular beaches, sheer sea cliffs along the Cape of Good Hope, scenic wine valleys and wildlife encounters from penguins to sharks. On Day 2, depart the city along the Atlantic Seaboard past the coastal suburbs of Sea Point, Bantry Bay and Clifton and stop for a photograph and to enjoy the view of Table Mountain’s towering Twelve Apostles. In Hout Bay, board a boat to view the Cape Fur Seal colony on Duiker Island (weather permitting). Journey over the 1,968-foot mountain pass of Chapman's Peak, past Noordhoek with a chance to see southern right whales offshore from June to November. See the fynbos vegetation, unique to the cape, viewing birds like the African black oystercatcher and Cape sugarbird, as well as Cape mountain zebra, bontebok and baboon as you enter the Cape of Good Hope National Park. Take in the views before lunch at a coastal restaurant and a visit to Boulders Beach penguin colony, then head home through the seaside havens of St. James and Muizenberg. On Day 3, depart the city to the Winelands region in the nearby Boland Mountains, where you can sample the region's high quality reds, whites and Cap Classiques (South African "Champagne") in the towns of Stellenbosch, Simonsberg, Paarl and Franschhoek. Enjoy a delicious lunch at one of the classic restaurants in the area. 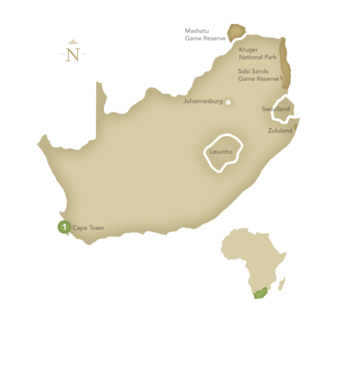 Your tour may take in sights like the Afrikaans Language Monument with its panoramic mountain views, the historic estate of Boschendal with its beautifully preserved Cape Dutch buildings and priceless period furniture, while idyllic Franschhoek, nestled in the valley where the French Huguenots settled in 1688, is a delight for antique lovers and gastronomes (the town boasts some world-famous eateries). Stellenbosch, South Africa’s second-oldest town, provides another glimpse of classic 17th and 18th century Cape style with a chance to browse quaint Dorp Street, visit the museum or explore the many galleries and shops of this university town. Bid farewell to the "Mother City" today as you are transferred by private vehicle back to the airport for your onward flight.